A few weeks ago we started a new series in our column aptly named, “What Is That? !.” Our goal is to shed light on some of the anatomical oddities that veterinarians are frequently asked about. This week we’d like to highlight the third eyelid, which is also known by its proper, and much harder to pronounce, name — the nictitating membrane. Although this is a normal structure in every dog and cat, you shouldn’t really notice it at all unless there’s something wrong. The third eyelid is a smooth fold of tissue tucked into the inner corner of the eye, beneath the lower eyelid. Despite its inconspicuous existence, it serves three important roles that are vital for eye health. First, it offers the eye protection by being a physical barrier in harsh weather and mechanically clearing debris off the cornea. Second, the gland of the third eyelid is a major contributor to tear production. If this structure is damaged, the eye’s ability to produce tears is diminished leading to an irritating medical condition called dry eye. Finally, the third eyelid is home to a portion of the body’s lymphoid tissue, serving an immune function. So what does it mean if the third eyelid is elevated? Well, it depends. Let’s start with an easy one first. 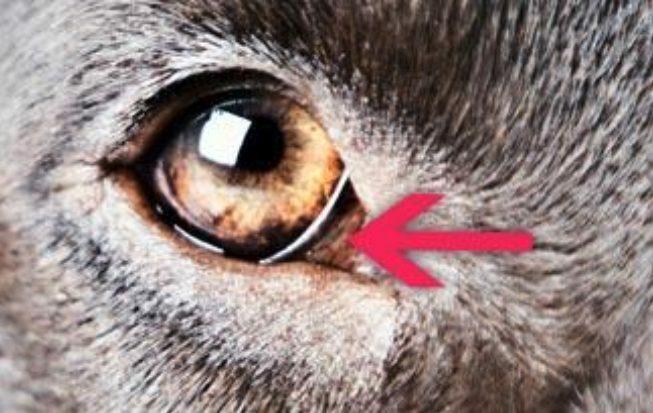 The third eyelid normally covers the surface of the eye when a dog is asleep. As they wake up, it may stay in this position for a short period of time. You’ll see something similar after sedation or anesthesia. What’s important to note in these cases is that the third eyelid will return to its normal position once the pet is fully awake. The most common “eye problem” occurs when the tear-producing gland of the third eyelid prolapses — you might hear this called cherry eye. Tumors or cysts of the third eyelid can look similar. And ultimately, a wide range of conditions that cause ocular pain or inflammation can lead to an elevated third eyelid. Ultimately, there are a dizzying number of conditions to consider — and if your pet has an elevated third eyelid it’s best sorted out by a veterinarian. Our hope is that this article encourages you to take a good, long look at your pet’s eyes and get familiar with what’s normal. Because in order to recognize something abnormal, you need to know what’s normal first!